I have a brand new lyric video out on YouTube that I'd love you guys to check out. It's the title track to my latest cd, "Abba's Child" and it's one of my favorites! Being in the music industry, it is sometimes easy to let what I do DEFINE me, but finding my identity first and foremost as a daughter of The King is the only way to keep myself steady and grounded in this shifting world that we live in. I hope you all find the lyrics in this song inspiring. And I also encourage you to find the book "Abba's Child" by Brennan Manning. After reading that book, it turned my life around and was definitely the inspiration to this song! May you all have a blessed holiday season and I'll see you all in 2019! I hope you guys enjoy the first lyric video from my latest cd, "Abba's Child"...... below is the story behind the song of "Go to the Mountain"! Go to the Mountain was written a few years ago with my friend Jon Vezner. Little did I know the true impact these words would have on me just a few short years later. I love the mountains. Especially the Smoky Mountains. We took vacations there as a child and I have very fond memories of times in Gatlinburg with my parents. My Dad especially loved the Smokies… and about a year before he passed away we got the opportunity to take him up there one more time. My in-laws, Ron and Jan Waldron had rented a cabin near Pigeon Forge for Thanksgiving, so all of Mike’s family drove down from Michigan and we met them there for the week. I think there was 12 or 13 of us in the cabin and Daddy was loved on and spoiled for a few days. It was his last trip on this earth and it was a great one. Here is a pic we snapped of him up at Newfound Gap. After my Dad passed away, we had a little inheritance money that we wanted to invest. We decided to try and buy some rental property in Nashville, but were having no luck finding anything in Nashville. I was having a lot of trouble shaking my grief and depression of losing my Dad, so Mike suggested we rent a cabin with some friends in G’burg for the weekend, and maybe do a little songwriting up there. So we drove up there and met our friends Rob and Lara Harris, (that was the weekend Rob and I started writing “Abba’s Child”), and Ron and Cindy Melcher. We were all sitting around the cabin and started talking about our search for rental property in Nashville. Suddenly Cindy chimes in with, “Hey, there’s a cabin for sale right down the road. Why don’t you buy that?”. We hadn’t even considered doing something like that but I was very intrigued. After looking it up online and seeing that the price was indeed right in the ballpark of what we had been looking to spend, we walked down the road to see the cabin. I swear it was love at first sight. It captured my heart immediately. It was at the very top of this mountain, with beautiful views of Mt. LeConte. We called the realtor listed on the sign right at that moment and asked if we could see it. Unfortunately someone was in it that weekend so no showings, but we made an appointment to come back two weeks later. When we drove back up there for the showing, our realtor had also gotten 8 more cabins for us to view. We went from cabin to cabin looking at beautiful places, each having it’s own charm. The last cabin she took us to see was the one we had found on the previous trip. When I saw it again my heart I loved it just as much as the first time I saw it and I swear, when I walked through the front door, I just felt like I was HOME. I honestly can’t describe the feeling. As I started walking around the cabin, I started noticing little signs on the walls with sayings like, “Family is everything”, and “This cabin was blessed from above”, and something inside me just knew that Dad brought us here. I walked out on the deck - overlooking those amazing mountains and I felt peace for the first time since Dad had passed. “This is the one”, I said to Mike. “Are you sure?”, he asked. “Oh YES, I am SO sure.”. I’ll spare you all the details, but I can’t begin to describe how smoothly and easily the negotiations and process of buying the cabin were. I kept saying how it was obviously meant to be. This cabin was just dropped in our laps out of the blue and it truly felt like a gift from God.. and my parents too. So, we named it “Heaven’s Gift”. We bought HG on Jan. 4th, 2016 and those first few days in the cabin felt like a dream. Being in the mountains was salve for my wounded soul. I feel close to God (and my parents) in a way I can’t describe up there. I had dreams of many songs being written up there.. and family gatherings… and special moments with friends. It would be a legacy to hand down to my children from their grandparents. I was attached in a BIG way to this place. But I was about to get a big lesson in the futility of attachment to things in this world. That lesson came in the form of the Gatlinburg Fires on Nov. 28th, 2016. If you are interested in reading about that horrible experience, you can read about that in my blog: Pt 1: The kids escape HERE… and Pt. 2: Mike's discovery HERE. But for now, to say I was traumatized would be an understatement. I was inconsolable for days. How could God give me such a beautiful place of respite for my soul and then rip it away so violently only 11 months later? It just didn’t make sense to me. But it was a stark reminder to me that there are many things that don’t make sense in this world, and me losing my 2nd home was probably not in the top million of unjust things happening. Still, I was pretty crushed. One week after the fire, Mike drove me up to see the property. My friends were concerned that I wasn’t ready to see it, but I knew i needed to go. Mike had already made one trip there, so he knew the devastation I was about to see. As we drove into our beloved mountain town, the tears flew freely as we drove through all the damage done by the fires. I’ll cover more about that in the story for “Out of the Ashes”, but it was horrible to see what had happened. When nature roars, no man can stop it. The damage was powerful to see. When we finally made it to the top of our mountain, I definitely cried many tears as I stood where our cabin used to be, only the walls of the basement remained. I prayed to the Lord up there… I prayed for the souls that were lost…. and for all the people who had lost everything… and I prayed for perspective in it all. I opened my eyes and looked around and I was suddenly taken aback by the beauty all around me. While driving up the mountain, all I could see was the damage the fire had caused, but now I was seeing the beauty of God’s work. The fire had taken what man had built, but NOT what God had made! What I loved about the mountains was STILL THERE. It wasn’t the cabin itself that I loved. It wasn’t the cabin that God and my parents had given me, it was THE PLACE. It was that mountain… and it was STILL THERE. Now the tears are flowing again, but for a different reason. My place of respite wasn’t in the four walls of the cabin… my place of respite is in God. He is my shelter. He is my safe place. And yes, I could feel Him so strongly up there… and that hadn’t changed one bit. I’m in the middle of a 3 week East Coast tour with the amazing Christopher Cross and his fabulous band. After this we go home for 4 days and then fly to Japan for our annual shows at Billboard Live in Osaka and Tokyo. Although it’s a l-o-n-g flight to Japan, it’s always a super fun trip. I adore Japan and the Japanese people. It’s always a trip I look forward to! Also, I’m starting to book some shows of my own to help promote my newest project, "Abba's Child" — Hopefully, I’ll be able to announce those soon. In other news: As many of you know, Reba McEntire has a double CD that was released on Feb. 3rd, 2017 and one of my songs, “God and My Girlfriends” is on it! (It is also on "Abba's Child" as well!) We were SO PLEASED that her CD, "Sing It Now: Songs of Faith and Hope" recently won a GRAMMY for "Best Roots/Gospel Album"! GO REBA! I wrote “GAMG” with my friends Lisa Hentrich and Patricia Conroy and we immediately felt like it was perfect for Reba and pitched it to her. Apparently she loved it too, because she quickly put it on “hold”. Well…that was 8 years ago! LoL So yeah, Reba took her time, but in her own time (or maybe in God’s perfect time! ), she finally recorded the song and did a beautiful job! We are happy and very proud to have this song finally coming out! Although the song isn't a "single" (yet, she hopefully types! ), I have heard from many of you that it is getting a lot of radio airplay around the country, and there is a hashtag #GodAndMyGirlfriends, with women posting pictures and videos on social media with their girlfriends. Some of them made me cry! It’s so sweet ya'll! Truly! I love that the song is empowering women to bond together because THAT is a beautiful thing! Ya'll go download the CD! "God and My Girlfriends Gathering"
That’s about it for now. I truly hope to see some of you at upcoming shows. That is one great thing about doing so much travel is getting to run into old friends and meet new ones! I am looking forward to an exciting 2018 for us all! Ya'll be good to each other and check www.marciaramirez.com now and then for more updates! I'm sitting here with tears streaming down my face as I close the last chapter of this book. Seriously guys, I can't tell you how amazing this book is! 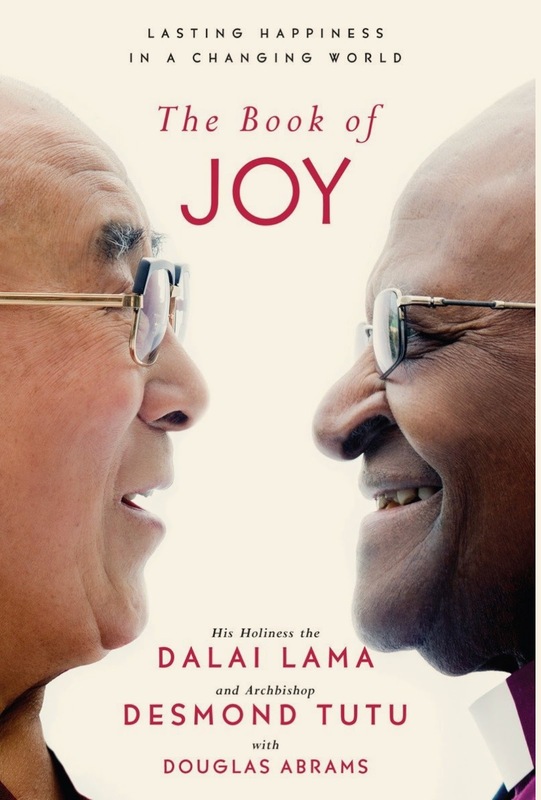 Author Douglas Abrams sits down with these two great spiritual leaders and over the course of a week he interviews them about life, love, happiness, sorrows... and JOY. They talk about the obstacles to finding true joy. They also outline the eight pillars of joy-- four pillars of the mind and four pillars of the heart. You get pulled into sweet, intimate moments between these two friends who both are so truly grateful to get a whole week in each other's company. A rare and possibly last opportunity for them to sit side by side, laughing, loving and sharing wisdom. Wisdom hard-earned by lives full of oppression and injustice. I'll admit, I didn't know much about either of these great men before reading this book. I had no idea the hardships they both had gone through in their lives, and continue to deal with on many levels. The Dalai Lama still lives in exile. They both have limited choices in how they live their lives, where they go and who they can be with. "Their joy is clearly not easy or superficial but one burnished by the fire of adversity, oppression, and struggle." - "The Book of Joy"
To see them rise above their difficult journeys and choose to live their lives with open hearts and giving spirits is inspiring to say the least. If THEY can choose love over hate, forgiveness over grudges, acceptance over judgement, contentment over bitterness, then I pray I can too. "Group identity is leading our culture right now. This is our group and this is what we believe and you're either in or you're out. We have lost our value in diversity." PREACH GIRL. People truly put more value into "fitting in" these days than on working to become exactly who God created them to be. When we start idolizing certain people and wanting to become in their "tribe" so badly that we change who we are to be included, well THAT is where we really can get ourselves in deep trouble. But back to the book. When you find two spiritual leaders setting an example of love and inclusiveness, I think we all would be well served to sit up and lean in for a good listen. These men have both been through incredibly difficult days, yet they are shining examples of how to find joy and purpose in life, even in turbulent times.